Are You Taking Time to Refuel? Whether you and I know it or not, fatigue is one of our worst enemies. Today, I’d like to talk with you about battling fatigue, and how to refuel so you can keep the monster of fatigue at bay. I’ve been making bad food choices for the last week and a half, even though I was making great choices for a long time before that. I am just “getting through” the things that I love, instead of relishing them. I feel like I could sleep for days. I just can’t do as much anymore. I haven’t gotten it quite figured out which specific changes I will make. In the meantime, though, I’m taking time to refuel. I’m going to bed earlier so I can SLEEP, SLEEP, SLEEP. I’ve spent this last Saturday refreshing my mind with some fun stuff. Bruce and I have sat around and watched a bunch of fun movies (Disney’s Earth, Fred Astaire’s Daddy Long Legs, and other ones I can’t remember). We’ve eaten out more than usual lately, which has helped me not have to cook. We do have to discontinue all this eating out because it’s expensive and unhealthy, but the rest from cooking has been really helpful. I’m saying “no” to things on my calendar. I’m really slimming down my time on Facebook. I love Facebook, but it can be such a time-drain, don’t you think? I’m trying to spend extra time in the Word before I go to bed every evening. My main quiet time is in the morning, but I’ve noticed that I sleep better if I also soak in Scripture before I go to bed. So I’m doing that on purpose, and it’s really helpful. What about you? Are you worn out, stressed out, tired out? If so, what do you need to do about it? 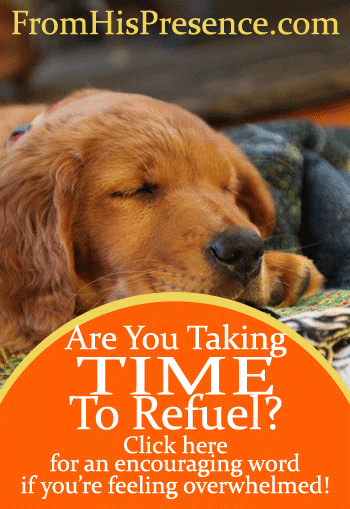 Do you need to take some time to refuel? It’s ok for us to say “no.” I have been the WORST about this for a long time, but it has caught up with me. Taking time to refuel has suddenly become just about Priority Numero Uno. So I would like to encourage you, too: If you’ve been worn out like I am, take a look at your commitments and your schedule. What can you get rid of? Even if you can’t get rid of something permanently, could you get someone to sub for you once in awhile? See what kind of help you can round up. Put your foot down. Make the first things truly the first things in your life. Are you an outdoor addict? Go hiking, even if your to-do list says you shouldn’t. Are you a movie buff? Reserve next Saturday and watch Netflix all day. Are you tired? SLEEP! Sleep is anointed by God! Sleep long and soundly. You’ll feel much better afterwards! By focusing our efforts on what’s really important and taking time to refuel, we can avoid burnout and take care of what really matters in the long run. What does your schedule look like? Are you over-committed? If so, what can you do about it? I’d love to hear from you in the comments below. Image courtesy of Diane on Flickr. Thanks for the reminder to “refuel”. I’m guilty of going and doing but is it to stay busy so I can say that I am busy for the Lord, my family and work and that’s what it is… busy work or am I being effective? Your blog caused me to stop and think. Do I want to do 100 things to say “Look how busy and driven I can be?” or do would I rather have only 10 things where I’m truly effective and not feeling burnt out? I would rather be effective than be busy. And oh, I loved your tip on beginning and ending your day soaking in the Word! Oh one last thing, I’m a movie buff too! Tom and I love animation alot! We love the creativity of it! However I do love a good Clint Eastwood movie! And we watched a good one this weekend! Thank you for being so transparent and someone we can relate too! Blessings to you! You’re so right. Effective is so much better than busy. I’m the worst about forgetting that sometimes (a lot of the times) though! So good! I know we can run and run and run, but after a while we aren’t doing anything well. Thanks for reminding me to take time to refresh! Sundays are a day of rest and I want to try to make them that! It is hard! Every time that little red dot comes up on my Facebook app on my phone, I want to grab the phone immediately and see what it is! And it could always wait, but can I wait? Ha. Not usually. 🙁 LOL. Hi, Jamie, I was concerned a while ago when you described being super-tired in a parking lot after a doctor’s visit, if I recall. It occurred to me then that your music ministry probably includes many instruments and amplifiers. Your fatigue could be the type that opera singers get from singing operas with orchestras. For a start, the operatic voice (but lots of other singers’ voices, too) literally has the force of a jet engine; plus, the band or orchestra is great for the audience that just comes and goes after three hours, but with rehearsals, multiple performances on some days and additional performances during the week, the singers and instrumental performers can exhaust their ears. By “ears” I mean the tiny muscles in the middle ear that control all kinds of body systems, behaviour, the sleep cycle, and states of consciousness. Those muscles “gate” sound, especially high-frequency sound, into the inner ear. When the muscles are overworked, they can’t control volume at certain sound frequencies, which starts to deafen the cochlea. Furthermore, the muscle as a whole cannot carry the same amount of sound into the brain and body if it has been weakened by overwork. The result is sound-deprivation to the brain. Fatigue is one of the first symptoms we notice. Having to sleep more than usual. Losing the ability to sing on pitch. Muscle and joint aches throughout the body There is a long list of symptoms that can push into the range of so-called “mental illness” (which is actually ear damage, too). Oddly, the remedy is to gently stimulate the ear with high-frequency music (e.g., violin concertos; music with unusual dissonances work for me) amplified with headphones, but not loud. Listen for no more than an hour per day for a week, working up to two hours maximum the second week. Ending each listening session with a half hour or 20 minutes of Gregorian chant is recommended by some therapists. If you think I may have honed in on your problem and you decide to try this, email me so we can stay in touch and I can teach you in more detail how to restore your ears. Hi Laurna! What a fascinating idea! I’ve never heard of that before. It’s so funny you say that. I do actually sit on the stage directly over a huge subwoofer (big enough for a 3,400-seat auditorium; it actually shakes the whole floor where I sit). I shall find some violin concertos and start listening. 🙂 I’ll let you know if it helps! Thanks for the idea! Hi, Jamie, You have my email address. Stay in close touch if you are running this experiment. I will have tips and comments for you. If you have had an underlying condition in your ears that you are unaware of (slight audio-deficits that you have adjusted to and that have created your “norm”) this listening exercise could open up new pathways of energy and that can be a little bit disconcerting. My experience with this approach began in 1997 with the Tomatis Method that healed our son’s dyslexia and my chronic fatigue syndrome and other family members who had been ill for 8 years. Dan was already addicted to various stuff and had a psychotic break shortly after his healing. It took me ten years to figure out how to heal his schizophrenia by a simpler method than Tomatis used. I have helped others to reverse bipolarity, dyslexia, the side effects of chemotherapy, depression, and I’ve made progress with schizophrenia but that is very hard to deal with online because it requires commitment from the caregivers and a lot of teaching. At the end of June I attended a conference in Toronto of the International Association of Music and Medicine and discovered the route God has led me and the books I have written are years in advance of the medical professionals in this field. We are still working on a frontier, however. Every person who consciously uses music to heal is running an experiment that adds more data to our knowledge. I have the greatest success with people who already know how to be prayerful about what they do. Big surprise? I don’t think so! One thing: you don’t have to pay attention to what you are listening to unless you happen to feel like it. You can work at your computer, read, sip a drink, sew, etc. or use a walkman and move around while the music exercises your ears. Eating interacts with the muscles near the ear and creates a kind of interfering feedback, so save the snacks for later. As your ears have been pounded, you will need to proceed slowly and carefully. And something needs to be done about the volume of sound from the subwoofer that is no doubt harming everyone exposed to it. 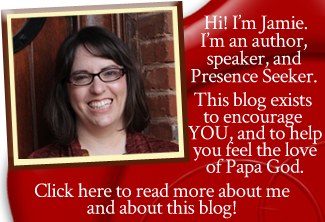 I won’t turn this email into a book, but you will want to learn more about how sound affects the body, especially loud, low-frequency sound, which counteracts language ministry, i.e., the sermon or teaching.